The “bold” flavor for this recipe comes from the curry powder. It’s really just enough to bring a touch of curry flavor, it’s not enough to overpower everything else you’re eating. The raisins in here give a touch of sweetness and balance to the curry flavor. Add in a touch of cayenne pepper if you also enjoy a good spicy chicken sandwich. 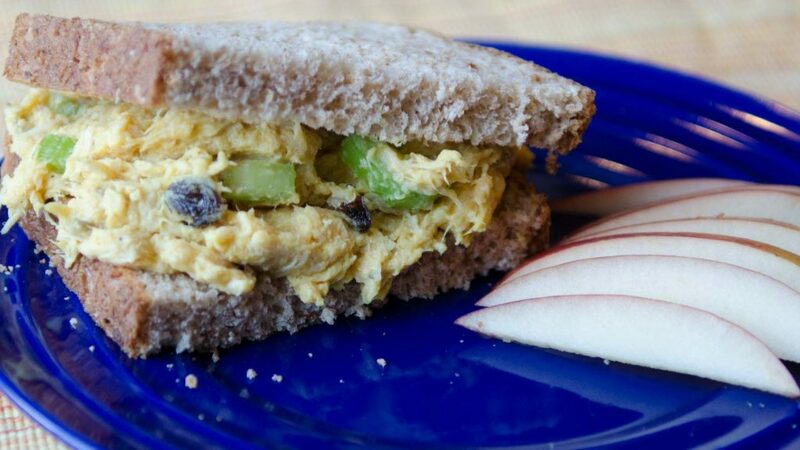 Another important element to a proper chicken salad sandwich is crunch. Celery is a classic addition. I also like to add in chopped, roasted nuts to the mix. Cashews are my favorite but slivered almonds, or even toasted sunflower kernels, would also be great. With two hungry kids, I have to make large batches and do so on short notice. So we buy the 6-packs of 1.25 ounce canned chicken from Costco. This recipe uses 2 cans, which will easily make 4 sandwiches and have a little leftover. If you’re conscious of calories in chicken salad, definitely opt for a low fat mayo or substitute in greek yogurt. I’ll add in a little lemon juice as well when making a greek yogurt chicken salad variation. Putting this all together is obviously pretty straightforward, but I will say that the order that you mix the ingredients is important. What’s key here is that you’re seasoning the meat, not seasoning the mayonnaise. Add the curry powder, paprika, salt, pepper, etc. to the chicken and mix it in well before you add in the mayo. 2 Tablespoons Chopped Nut Cashews, Almonds, etc. Add the curry and paprika. Salt and pepper to your liking. Mix well.